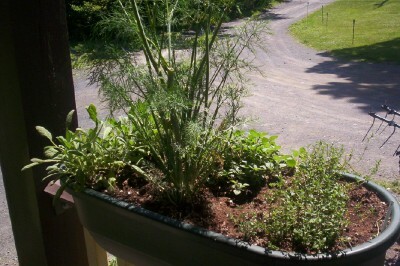 As I wrote earlier this year, I started my kitchen herb garden. I did not plant them in the ground, but in several planters I purchased at a local Agway. These particular planters are about 2 feet long by 1 foot wide. They have a groove along the bottom that fits the railing on my front porch perfectly. You can get different planters for different size railings. Depending on the herbs, you can pack quite a few in there. You do have to keep in mind that some herbs are a little more aggressive than others. In one planter, I have a spearmint plant that short of putting the entire thing in the oven, nothing can stop it. I prune it weekly even if I don’t need the herb right away. Since this is the case, I only planted two other plants (basil) along with it. As you can see in the above photo, the planter closest to the camera shows what I mean. The mint plant in the center was brutally pruned just last week and it is already back in full force. Dill is another herb that just grows like crazy. Yes that big monstrosity in the center is the dill plant. I am about ready to whack it down as it is taking over the box. A good hard prune once in a while just makes it more determined to grow. 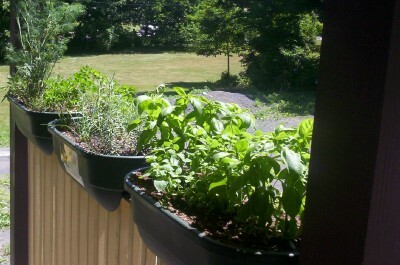 All in all, I have basil, thyme, sage, rosemary, spearmint, oregano, parsley and chives growing in these three planters. They are about a 3 second walk away from my kitchen and when it is time for fresh herbs to go into a dish, I have them instantly. Planters require a bit more watering than if you planted in the ground. The containers dry out quickly so I completely soak them until water runs out the drainage holes, about twice a week. I did hit them with some miracle gro when they were first planted just to get the roots started, but otherwise they grow just fine without any help. A good potting soil should be all you need. A lot of the time you just end up having too many herbs, so I usually prune them, and either give them to friends/family or freeze them. It is always better to have too much than be scrambling and/or over-pruning when herbs are needed. The cost savings is immense. Had I paid for all the fresh herbs I have used based on what they charge at the supermarket, I would have spent three times what it took to get this herb garden going, and it is only June!